The silly season for professional artists is in full swing, Open Studios. I am a member of the Open Studios West Berkshire and North Hampshire scheme. It was set up in 1987 by the late Pat Eastop MBE as a non-profit organisation to celebrate the diversity of visual arts available within the local community. It strives to create a dialogue between artists and the community by encouraging members of the public to visit artists’ studios. Every May over 100 artists open their studios and exhibitions free of charge and are happy to talk about their creative process with visitors. We work to make entering any art space a comfortable experience, to encourage and promote accessibility to art and artists. Works of arts are normally for sale but there is no obligation to buy, the focus is on enjoying your visit. Open Studios is organised entirely by a committee of volunteers made up of artists and other professionals who generously donate their time each year to ensure the scheme runs efficiently and within budget. I am one of those volunteers and countless months, weeks and days of work are finally behind me. Now all I can do is send off a few last Press releases and visit some studios. I tend to open my studio every other year, giving me time to refresh my work and free up time to get inspired by my colleagues. 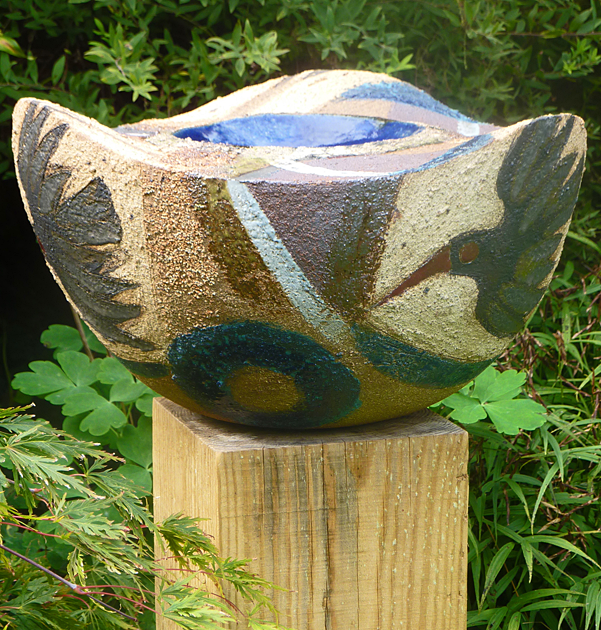 So far I have visited Diana Barraclough, ceramicist www.dibarraclough.org.uk, in Hungerford. With her this year she has painter David Jones, print and book-maker Mavina Baker and fellow ceramicist Emily Myers. We visited them on their pre-view evening which was bathed in soft early summer light. This made the stroll around her garden to view the totem poles and bird baths a delight, enhanced further by the glass of red wine so generously and thoughtfully given to me upon entry. Cautiously making our way down steep steps from the main viewing area, on the ground floor of her beautiful home, we emerged into the basement and the creative heart of the studio. Sketchbooks open on worktops needed to be flicked through, small vessels begged to be held. Inspiration was drawn from the Cornish coast, small sea birds, water and fishing boats were abundant. Contentedly we walked all of 5oo yards along the road to our next studio, painter and drawer Shirley Cartey. Whilst the landscapes swept you from local scenes of Coombe Gibbet in the UK to the Grand Canyon in America, I found myself drawn (excuse the pun) to her beautiful life studies. A few days later I set off, on my own this time, to visit fellow photographer Giles Penfound www.picturesonapage.net . Even though it is now technically May, heavy April-like showers greeted me as I arrived at his home in Newbury. I have been admiring his black and white landscapes since he joined the scheme last year and wanted to take the time to meet him. His work, for me, has a commanding use of contrast and composition. Happily Giles and I found ourselves in that artists bubble where we chatted easily about film and digital photography, equipment likes and dislikes and the feeling of solitude that can be overcome when you open your studio to strangers. All photographs are the property of the original artist. I’m excited to collaborate with VIDA for this collection. VIDA is a new kind of fashion ecommerce company that connects artists like me all over the world with producers to bring our work to life. For every product sold, VIDA hopes to provide the gift of literacy to the makers they work with. I have shown images of my 4 favourite items from this collection.